I was recently contacted by a representative for Fresh Produce Clothes, a California fashion retailer. Having lost some weight, I’ve been excited to have new things to wear in my wardrobe. I was told to go on the website and pick anything I wanted. How cool is that? The Fresh Produce site was full of unique womens tops that were stylish and age-appropriate. After being in the upper sizes of everything available in plus size stores, I was excited to find stuff young and fashionable. Also, can I say how refreshing it is to see a website that actually uses plus-size models? It’s frustrating to see an outfit on a “normal model” and try to imagine it on your larger frame. 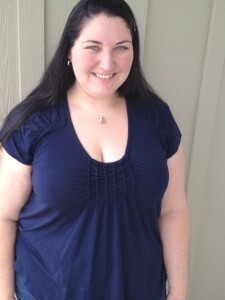 In many stores and in many websites, even a plain plus-size t-shirt could run me $40, and usually it wouldn’t fit well. For similar prices, Fresh Produce offers an impressive variety of stuff co cute, I could hardly decide on just one thing. As soon as I pulled the shirt out of the mailer, I knew I’d love it. It’s got the right amount of stretch to emphasize my curves, and the length wasn’t too long or too short. I was surprised that the sleeves have an unfinished edge, but even after a few washings, it hasn’t frayed. My only problem, which was more with my frame than with the shirt itself, was that the scoop neck goes LOW on me. I’m constantly tugging at the shirt so that it doesn’t show the top edge of my bra cup. I’ve tried wearing the shirt with a Shade and a HalfTee, and it doesn’t look quite right. I might have to alter the top seam of the shirt to avoid that hassle. But overall, I LOVE the shirt. I always get compliments on it, and it’s a good shirt for the transition phases of my weight loss. I got it in a 2x, and the fabric is definitely baggier in the last 3 weeks than when I got it. But luckily, the fitting through the shoulders and arms is just right so I’ll still be able to wear it for some time to come. FTC Disclosure: I received this clothing item from Fresh Produce clothing free of charge in exchange for a blog post to review the item. Opinions in the post are my own. Estimated retail value $64.